Brough Shakes The Salt & The Sand with Ace Cafe London! Ace Cafe London is thrilled and privileged to once again be able to confirm being part of, and supporting, the Brough Superior Team heading out to break and reset land speed records in multiple classes, in August, on the famous Bonneville Salt Flats, USA, with two motorcycles, a "Retro" and a "Pendine", based on the iconic 1927 SS100, a machine sharing heritage and fame with Col. T.E. Lawrence - "Lawrence of Arabia". Brough were on the salt previously in 1949 with a streamlined machine ridden and crashed by Noel Pope - he vowed to "never ride a streamline again", and on returning to Bonneville in 2011 the new, unstreamlined, Brough Superior SS100 Retro, with a specially tuned J.A.P. V-Twin engine, running on "pump" fuel, clocked two runs, at 127 & 122 mph respectively, giving a mean average speed of 124.98mph and breaking the MA 1350-A-VG speed record! The 2013 Brough Superior Team, much larger than in previous years, includes riders Eric Patterson, Alan Cathcart and Henry Cole, all flying the flag for England! 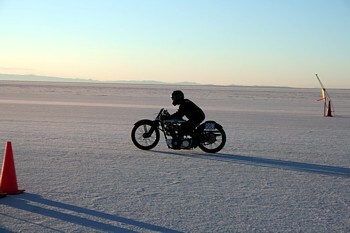 In addition, over the weekend of 22nd & 23rd June, the Brough Superior Team, together with Ace Cafe London and support crew, will be racing on Pendine Sands, Wales, the historic home of land speed racing in the UK and where, in 1928, a specially prepared SS100, built and ridden by George Brough, came first and subsequently gave rise to a limited number of very fast, and now very rare, high performance "Pendine Racers" being produced at the Nottingham factory. An SS100 Pendine Racer is currently on display at the Ace, courtesy of Mark Upham, CEO of Brough Superior Motorcycles Ltd, who confirms that Brough, made in England, looks forward to racing and to setting new records at both Pendine and Bonneville.